Matt here, doing a quick self-post since Joon is spear-hunting pufferfish in Tahiti this week (not actually true, to my knowledge). Take the first letter of those clued entries in grid order (top-to-bottom) and they spell the contest answer, the classic 1953 Western SHANE. This entry was posted in Daily Puzzles and tagged contests, Matt Gaffney. Bookmark the permalink. I was very much distracted by the alliterative two-word clues. Trying to relate these clues (puzzle title! )/answers to each other and/or to the starred entries by vaarious means was unfruitful, and I never returned to the meta. Alas, it was week-2 simple. They’re very much a crossword trope; I merely ascribed undue significance to this set, this time. I liked this one a lot. SHANE is certainly a famous movie, though with Matt’s customary brilliance, I’m just a bit surprised the answer wasn’t something connected to the technique like SLEUTH. Can’t complain, though. We’ve been spoiled over the years by all Matt’s gems, and if this wasn’t astonishing, it was still a very solid meta. A couple of solvers mentioned that “Shane” is just a famous movie, not something that ties in in another way to the theme. Ideally that’s what I’d want, but there are surprisingly few movie titles whose names double nicely as crossword clues, so I was lucky to even get SHANE after a long struggle. Discounting 1-word titles (which I thought would be a bit cheap to use), something like 20 of the top 1,000 titles on IMDb were worthy of consideration. Wow, I was 1000% certain that NOR STEEP had to lead to the answer since it was the symmetrical match to FIRST MAN and the other theme answers were symmetrical. I saw the matching answers ADAM and HACK were symmetrical, decided it was FLA that was hot instead of SALSA (because it matched ESP in the grid), and figured that I needed a movie that made sense with TEAM UP because that matched up with NINJAS. The symmetry of the other things threw me down a rabbit hole I never got out of. (I decided that the movie was Network, because it made sense with TEAM UP) even though I couldn’t figure out how to get Network out of NOR STEEP. Ugh. Talk about overthinking something. I don’t think I’d have gotten this if not for HACK sharing a row with TAXIDRIVER. With that spotted, though, the rest quickly fell in place. That was definitely what screamed off the page at me. I think I would still have gotten it, but that made it *much* easier. I paired Taxi Driver with Louie (Danny DeVito character on Taxi) which left me with A S L N And E which I wanted to unscramble to make ALIEN… Since no one likes their IPAs hot I gave up and submitted (guessed) Top Gun because Ace was in the grid. Oh well…still a lot of fun. Taxi Driver did me in. Knew it wasn’t the show Taxi but thought it was usher. Missed hack all together. Was almost there. Great puzzle. Got there eventually, but with FIRST MAN not having a symmetry buddy, I was stuck on LITH surrounding IKE in SOME LIKE IT HOT, combined with the fact that IKE was president in 1959 and all the other country abbreviations floating around. I pieced that all together but then thought that we needed to find fill that would hint at another movie. I found SUMO and submitted THE WRESTLER, my first second week fail, oh well. My thinking was to look for a movie whose title was a clue to another grid entry, and after a maddening hour or so “Top Gun” popped into my head, with the solution being ACE. That clicked so hard I was positive it was right. I missed Shane because LOUIE was a driver in Taxi. That seemed reasonable enough to go with, especially as it kept the letters in the proper order to spell SHANE, but I did comment on the [perceived] inelegance of using MEN IN BLACK to clue two different entries when it matched one of them exactly. I apologize for the errant critique, Matt. Mea culpa! I got this in a bizarre way. I was working on a puzzle Friday morning that had ESP in the exact location where Matt had it in this puzzle. While I was filling the grid and got “The Sixth Sense,” I thought to myself, “I remember that movie. That was a weird one.” Perhaps because ESP was the last thing I filled in in the other puzzle, this came to mind. So now I’m looking at these theme fills and wondering what they have to do with each other and I noticed nothing. Remembering ESP, I started looking at other words in the grid, from the top down. Salsa clicked with “Some Like it Hot” and I was off and running. This is the way easy puzzles should be. The theme idea and its execution are so good that it was a delight to solve even though it wasn’t all that challenging. Also, as I commented to Matt, there’s an alternate answer for “some like it hot” – scone, which some do indeed like hot but others prefer room temp – but, conveniently, it both starts with the same letter and precedes all the other clued entries in the grid. 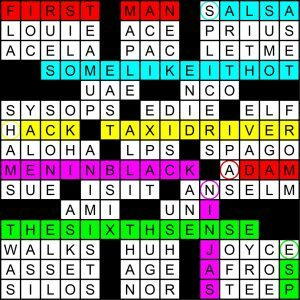 I noticed the movie titles and corresponding words describing them (First Man-ADAM, Some Like It Hot–SALSA, Taxi Driver–HACK, Men In Black–NINJAS, and The Sixth Sense–ESP) and started looking for a descriptive word that would match a famous movie. I saw SHAMS and sent in The Sting. Oh well. Five Star puzzle for me!